Posted on February 8, 2016 at 12:36 am. The Chinese New Year is an important festival, with huge celebrations happening all around the world including United States. Never one to miss out the chance to celebrate, Roxy Palace is getting down with the festivities by offering up to 10,000 free spins to mark the start of the new lunar calendar – and all you need to do to win is play your favourite pokies. From Thursday the 4th of February to Thursday the 11th of February, head to RoxyPalace.com, click on the 10,000 Spins Chinese New Year Special within the promotions page and enter your user name to opt-in to this promo. Now for every $10 of real money you wager on any of the pokies at Roxy Palace you’ll earn one point, with points giving you the chance to gain a place on the leader board. Points are accumulated on all pokies, so you can play any of the extensive range of Microgaming slots at Roxy Palace including new titles like Bikini Party, Lucky Twins, Peek-a-Boo, Bullseye, Serenity, Star Dust and tonnes more. At the end of the promotional period the top 100 players on the leader board will have their accounts automatically credited with their share of the 10,000 free spins. The player taking the number one position will walk away with a whopping 1,000 free spins all to themselves. The winning free spins can be used for desktop or mobile play and will be awarded at the maximum number of paylines, with a coin size of 0.01 at one coin per line. 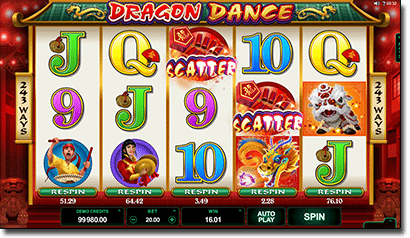 All free spins are to be used on the new Microgaming game, Dragon Dance – a vibrant new pokies game honouring the beauty and enchantment of the Chinese New Year. This five reel, 243 ways pokies game is packed with bonus features like free spins, re-spins and a jackpot of up to 60,000 coins and will definitely get you into the spirit of this culturally significant holiday. For those gamblers who are extra superstitious, the Chinese also believe there are some things that should be avoided altogether on the first day of the lunar new year. It’s believed that you should not wash your hair on the first day as the Chinese word for hair is similar in pronunciation to ‘to become wealthy’ and therefore washing your hair means you are washing away your potential wealth. Similarly, stay away from the broom as to sweep your house on this day means you are sweeping away the chance for wealth. Crying babies are also believed to bestow bad luck up on the family, so if you have children it’s advised to try and keep them as happy as possible on this important day. See if the Year of the Rooster will bring you good luck by opting-in to the 10,000 Free Spins Chinese New Year Special at RoxyPalace.com. If you’re new to this casino, click our links to sign up and you’ll receive a welcome package of up to $350 in matched deposit bonuses. Gong xi fa cai!